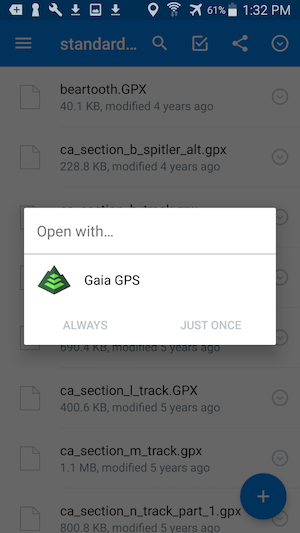 Learn how to import GPX and KML file to Gaia GPS for Android. Click here for instructions on importing to Gaia GPS for iOS. 1. Email a GPX or KML file to yourself as an attachment. 3. Locate the file you would like to import on your SD card and tap it. When the screen reads "Successfully Imported Track(s)" your file will be available in your saved folders. Hi, this didn't work in that it said it imported the file, but the screen says it successfully imported tracks. The file contained only waypoints, and there doesn't seem to be an option to have it import waypoints. Hi, I tried both. I used DNRGPS to export a gpx from a shape file, and QGIS to export a kml/kmz from the same shape file. The kml brought over the points, but each point has an I'd I'd like to keep, at that seems to be lost. The gpx import only seems to want to bring in tracks. I know the file is o.k, because the gpx points display when I put them into QGIS. @pbolstad can you click 'Submit a Request' above and send the file to the support team? Someone can definitely take a closer look. FWIW I think the 'Successfully Imported Tracks' message is generic and can apply to waypoints as well. You should be able to find everything in a folder within the app after import. For current Dropbox app for iOS, you have to open up the file and select "Export" and then "Open in" and select Gaia GPS. I see a lot of Android users in our Seattle Mountaineers Navigation class. Most of the time, they just download the file from their email client, and it will go into a "downloads" folder on the internal storage. They must then use the "import file" function of their GaiaGPS App. The challenge is their lack of familiarity with Android file structure. Once they find the appropriate download folder, the Gaia App remembers it for future use. To find the "downloads" in the Gaia Import screen, they might start at the base of the file system, as shown below. The folder named "sdcard" is actually the internal storage, not any external SD-Card. The external SD-Card, if any, will be under the "storage" folder. Select "sdcard" from above, then select "downloads" or "Download" from the next screen. It depends on the email client whether it will be in one or the other. Then just find the GPX file within the downloads directory and import it. STORAGE -- The internal storage is actually /sdcard but also under /mnt/sdcard (So the downloads folder is in /sdcard/downloads or /mnt/sdcard/downloads). Hit the green arrow in the upper left corner to go back a level in storage if you get lost in the file system. Any separate SD-Card will be found under "storage", rather than "sdcard". Anyway, check both folders (downloads and Download), and check both storage locations (internal and external) for the GPX file.